*The author of this article confuses human trafficking and smuggling. 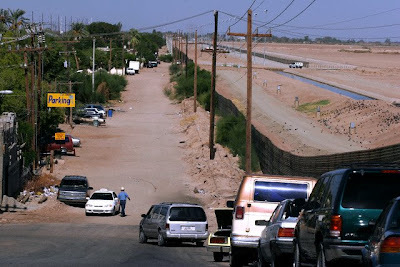 The operation detailed in this article states that illegal immigrants who had crossed into the U.S. from Arizona payed for transportation to cities across the country. This is smuggling, NOT trafficking- please know the difference. Six people were arrested this week in a human-smuggling operation based in Los Angeles that involved thousands of illegal immigrants held in horrid conditions. Agents with Immigration and Customs Enforcement culminated a three-year investigation that began when police found about 140 illegal immigrants locked inside two "drop houses" in South Los Angeles. "We believe this ring was probably bringing 100 aliens a week into the L.A. area," ICE spokeswoman Virginia Kice said. "You're looking at a lot of people - and a lot of money." Agents said the three ringleaders are all named Francisco and worked only in the U.S., picking up immigrants they called "pollos" - Spanish for chickens - who had crossed the border into Arizona. The "pollo books" were seized in raids on Wednesday and show the ring charged clients $1,200 to $3,700 each for transportation to cities across the U.S., according to an affidavit filed in federal court. From August 2004 to Jan. 5, 2007, one of the ringleaders had $456,897 deposited into bank accounts. "The significant thing about this organization was that it moved a very large number of people, and they had a specialty," Kice said. "They had their niche. They handled domestic transportation only." Three Guatemalan nationals were accused of being ringleaders: Francisco Andres Pedro, 35, who appeared in court Thursday; Francisco Andres Francisco, 39, arrested last month in Pennsylvania; and Francisco Pedro-Francisco, 29, who remains at large. They are among 13 individuals, linked to what agents call the Francisco ring, who face charges of transporting and harboring illegal immigrants. One suspect, a Guatemalan native, had been deported four times, authorities said. Over the course of three years, more than 800 immigrants linked to the operation have been arrested nationwide - some on the road and some in drop houses where they await transportation. One SUV linked to the Francisco ring overturned in Arizona, seriously injuring 10 immigrants packed inside, Kice said.